Wainui is an old established area, which saw people with English, Scottish and Irish roots settle around 1850. Among the first settlers were two farmers, Hutson and Thick followed by King, Lloyd and Jacob. In about 1860, the Lambert, Lamont, Fennell and Scott families started to clear further land for cultivation. Four of these pioneering names were chosen for our School House names. When these settlers arrived Wainui consisted of tea tree and fern with fairly extensive areas in virgin bush, including magnificent kauris. The two main means of livelihood open to the settlers at that time were timber and gum-digging. As early as the 1860’s, formal schooling was conducted, not in a schoolroom, but in the teacher’s own home. In 1870, the local Presbyterian church was built which is depicted on the Wainui School logo. By 1878, the need for a school was obvious so the schoolhouse was built, then the first classroom opened its door at the beginning of 1879 but the head teacher had to be shared with another school (Locknorrie) so schooling only lasted until lunchtime. 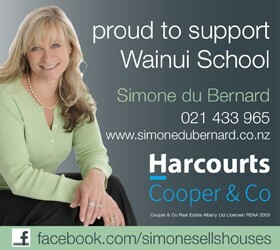 It wasn’t until 1912 that Wainui became a full time school with a roll of 20 pupils. At this time there was no transport to the nearest high school so pupils stayed on until they were 15 years of age. By 1946 another classroom was required as the roll had risen to 60 pupils and with more farms being developed in the area this was to be a continuing theme. In 1969, the original old school room had become redundant as new classrooms were built. This building was removed from the school grounds and now stands in the Auckland Museum of Transport and Technology. Over the years the roll has continued to grow and with more farms being sub-divided this will be a continuing trend. 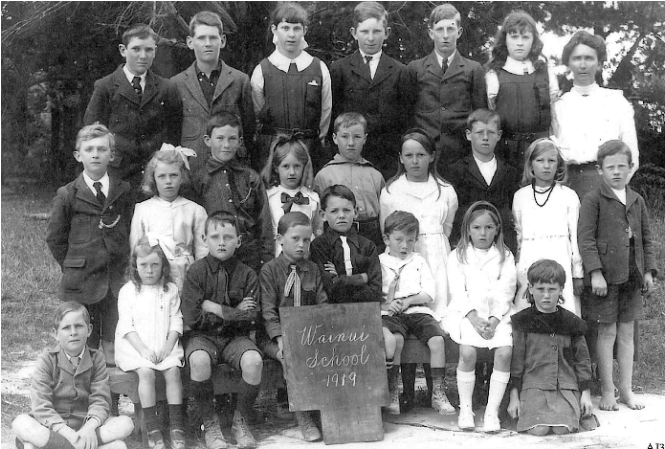 By the beginning of the new millennium the school had reached 200 pupils. While traditionally a farming area, the makeup of the area has changed somewhat. Most of the contributing families are now small holding “life-style block” owners, working in the local area, the North Shore or Auckland City. We as a school will continue to evolve throughout the 21st century to be an innovative and successful place of learning.